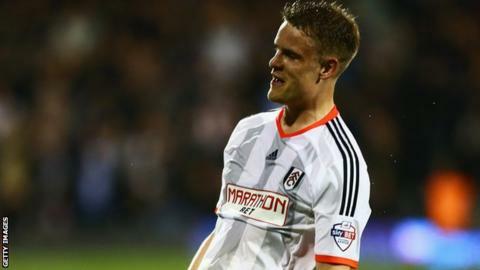 Matt Smith's header earned Fulham a win at relegated Blackpool and all but secured safety for the Cottagers. Blackpool almost took the lead inside five minutes when Henry Cameron struck the post with only the keeper to beat. Cameron had another shot saved a minute later, but Smith put Fulham ahead when he nodded in Sean Kavanagh's cross. Nathan Delfouneso had an effort cleared off the line for the hosts, while Gary Madine had a late effort well saved by Fulham goalkeeper Marcus Bettinelli. Fulham are now nine points clear of the Championship relegation zone, although 22nd-placed Millwall have three games to play and could still catch Kit Symons's side if they win all their games and there is a 10-goal swing in goal difference. Smith could have made the game more comfortable shortly after scoring, but he headed Kavanagh's corner wide from six yards out. Midfielder Jose Cubero came closest to drawing the home side level before the break, but he could not direct his diving header on target. Fulham lost Smith to injury at the start of the second period, before Tangerines midfielder Jamie O'Hara looped a left-footed effort just over the bar. Cauley Woodrow ought to have doubled the visitors' lead, but instead he headed over when unmarked inside the box. Delfouneso nipped in front of Bettinelli and his shot across goal looked to be heading in before Cottagers defender Ashley Richards recovered to clear the ball off the line. Striker Ross McCormack fired straight at Blackpool keeper Elliott Parish after a swift counter-attack, before Bettinelli denied on-loan striker Madine to secure a crucial three points for Fulham. Fulham boss Kit Symons: "Mathematically we need one more point but this was a massive game and result for us. I said that to the players before the game it was all about finding the win and the three points. It wasn't a classic. It's not one I will show the grandkids in years to come. "It's been tough lately to say the least. It's not been the most enjoyable but that's four away games now unbeaten without playing well. We did ride our luck a bit and we've not had an awful lot of luck this year to be honest so maybe it's a little bit overdue." Blackpool boss Lee Clark: "I'm frustrated for the players because we didn't get what we deserved. I think we've dominated the game from start to finish. We might have even felt harshly done by had we only taken a point. It's the story of our season really. "A lot of the players are playing for their futures. We've obviously made decisions on Andrea Orlandi and Jose Miguel Cubero and we will continue to talk all the time and the players will know what the decisions on them will be after the final game of the season against Huddersfield." Match ends, Blackpool 0, Fulham 1. Second Half ends, Blackpool 0, Fulham 1. Corner, Blackpool. Conceded by Marcus Bettinelli. Attempt saved. Gary Madine (Blackpool) right footed shot from outside the box is saved in the top left corner. Darren O'Dea (Blackpool) wins a free kick on the left wing. Foul by Cauley Woodrow (Fulham). Attempt missed. Dominic Telford (Blackpool) left footed shot from the centre of the box is just a bit too high. Assisted by Peter Clarke following a set piece situation. José Cubero (Blackpool) wins a free kick in the attacking half. Foul by Danny Guthrie (Fulham). Attempt missed. Henry Cameron (Blackpool) right footed shot from outside the box is just a bit too high from a direct free kick. Gary Madine (Blackpool) wins a free kick in the attacking half. Foul by Michael Turner (Fulham). Offside, Fulham. Ashley Richards tries a through ball, but Ross McCormack is caught offside. Attempt saved. Ross McCormack (Fulham) right footed shot from outside the box is saved in the bottom left corner. Assisted by Ryan Tunnicliffe. Hand ball by Cauley Woodrow (Fulham). Foul by Tim Hoogland (Fulham). Attempt blocked. Nathan Delfouneso (Blackpool) right footed shot from the right side of the box is blocked. Attempt missed. Gary Madine (Blackpool) header from the centre of the box misses to the right. Assisted by Jamie O'Hara. Offside, Fulham. Marcus Bettinelli tries a through ball, but Ross McCormack is caught offside. Substitution, Blackpool. Nathan Delfouneso replaces David Perkins. Substitution, Blackpool. Dominic Telford replaces Andrea Orlandi. Corner, Blackpool. Conceded by Dan Burn. Attempt blocked. Andrea Orlandi (Blackpool) left footed shot from the centre of the box is blocked. Peter Clarke (Blackpool) wins a free kick in the defensive half. Substitution, Blackpool. Niall Maher replaces Tom Barkhuizen. Attempt missed. Cauley Woodrow (Fulham) left footed shot from the left side of the box is just a bit too high. Assisted by Danny Guthrie. Attempt missed. José Cubero (Blackpool) right footed shot from outside the box misses to the left. Assisted by Gary Madine. Offside, Blackpool. David Perkins tries a through ball, but Henry Cameron is caught offside. Attempt missed. Cauley Woodrow (Fulham) header from the centre of the box is too high. Assisted by Ross McCormack with a cross following a set piece situation. Cauley Woodrow (Fulham) wins a free kick on the right wing. Attempt missed. Jamie O'Hara (Blackpool) left footed shot from outside the box is too high following a corner. Corner, Blackpool. Conceded by Danny Guthrie. Substitution, Fulham. Cauley Woodrow replaces Matt Smith because of an injury. José Cubero (Blackpool) wins a free kick in the defensive half. Second Half begins Blackpool 0, Fulham 1.